So I know my last post also had a little something to do with chocolate and peanut butter. This clearly reveals my OCD tendencies (note the two recipe posts before this chocolate and peanut butter explosion were both lemon-related--I was having a lemon moment, people). But hey, we're friends, I can reveal such things. Like how I'm the sort of person who will get hooked on a particular combination of ingredients from the Whole Foods salad bar and I will go back to the same Whole Foods to assemble said salad every single day for, like, five days straight and I'll feel fantastic about it. Or I will settle on a certain pants and top combination that just feels so right that I will do a teeny load of laundry every night just to wear the same outfit for many days in a row. Not very green of me, I suppose, but I tell myself that having the magical outfit be clean on sequential days cancels out the crazy. So. Anyway, let's not talk about my weird eating and dressing habits. Let's talk about how Fathers' Day is coming up and boy, you'd better come up with something good this year. 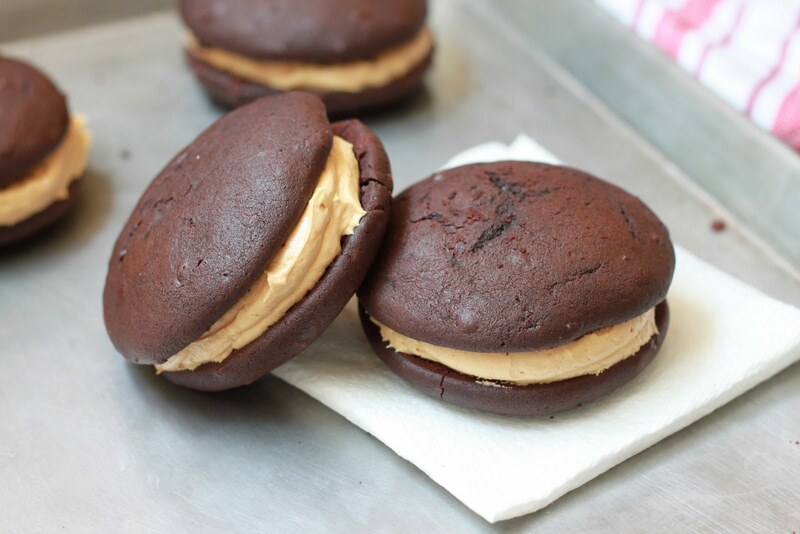 May I recommend these very masculine whoopie pies, for instance? There's just something so Dad-ish about the combination of chocolate and peanut butter, AMIRITE? It's just so very solid and substantial and dude-ish. And given the fact that the husband nearly ate them all when I made them should tell you something. This would be a good time to brag mention that the husband is also THE BEST father I've ever, ever seen. Like really, truly. He is kind but firm, endlessly entertaining, infinitely more patient with Little C than I. Plus, he is easily the hottest dad at the playground at all times. Besides his excellent fathering, he also eats at least one serving of everything I bake, but when boyfriend plows through a batch of something like he did with these whoopie pies, I know I've really hit on the sort of thing that can only begin to reward him for fighting the good fight of fatherhood the way he so tirelessly does. So if you've got a dad or dad figure like this in your life, whip up some dang good whoopie pies for the guy. Or hey, while you're here and all, why not check out a few more recipes that also make for spectacular homespun gifts for deserving dudes? 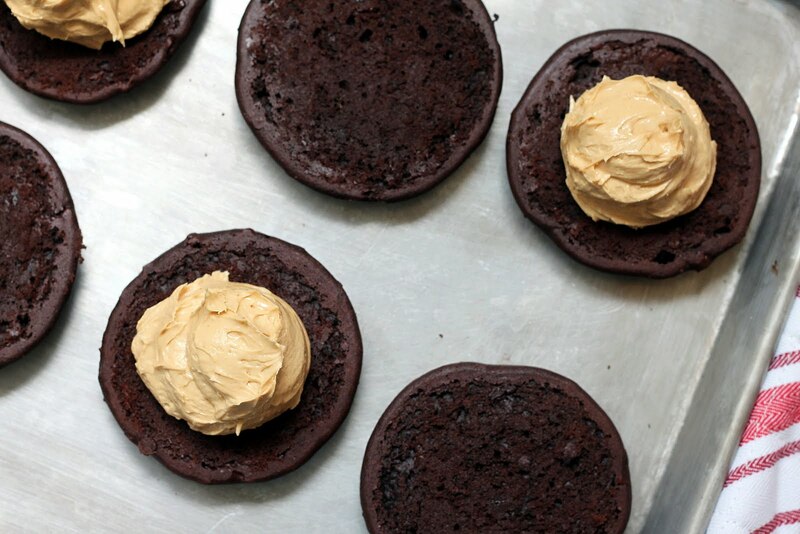 To make the most decadent whoopie pies, use the darkest, richest cocoa powder you can get your hands on for the cakes. For the creamiest, most addictive filling, I prefer commercial peanut butters here (like Skippy). These can be made a day ahead—just refrigerate them in an airtight container and bring them back to room temperature before serving. Position the oven racks to the upper and lower thirds of the oven and preheat it to 350 degrees. Line two baking sheets with parchment paper or silicone baking mats. In a large bowl, sift together the flour, cocoa powder, baking soda and salt. In the bowl of an electric mixer, beat together the butter, brown sugar, vanilla and espresso powder until light and fluffy, about 2 minutes. Beat in the egg. Reduce the mixer speed to low and stir in the buttermilk. The mixture will look funky—curdled, terrible. But press on, it will smooth out when the dry ingredients are added. Keeping the mixer on low, gradually add the dry ingredients. Increase the speed to medium and beat just until the batter is completely smooth, about 30 seconds. Fold in the mini chocolate chips by hand. Scoop the batter onto the prepared baking sheets into level 1/4 cup portions, 8 scoops to a sheet (a standard ice cream scoop is perfect for this task). Bake until the tops of the cakes spring back when lightly touched, 12-15 minutes. Let cool on the pan for five minutes before removing to a wire rack to cool completely. To make the filling, beat together the peanut butter, butter, confectioners’ sugar and salt on medium-low speed until smooth. Crank the speed up to high and beat until lightened in color and texture, about 1 minute. Dollop the filling onto half the cakes (1/4 cup of filling per whoopie), and sandwich with the remaining cakes.